We just bought the new Skylanders game, Superchargers. It's our first Skylanders purchase, however my kids have played the game at friends and have surprisingly deep knowledge of the game already. Skylanders Superchargers is the fifth game in the series, starting with Spyro's Adventure back in October 2011. Tracy purchased Skylanders when it first came out and have since bought Skylanders Giants, Swap Force and Trap Team for her kids. She tells me, the new Superchargers is quite special as it's a new type of game play for Skylanders - RACING! My kids have been asking for Skylanders for a while now. With a fairly old Wii at home, I was very pleased to find the game is available for Nintendo Wii. As this was our first Skylanders purchase, we opted for the Starter Pack. We are very familiar with Nintendo games, and the kids were very excited to find a guest character in our pack - Bowser! He is a beefy character and a firm favourite in our house, so you can imagine the excitement when we saw him. What's really cool is the Nintendo characters, included in Skylanders packs, are compatible with Amiibo* gaming, so you get two options for the price of one! So in our Wii Starter Pack we got 2 figures, one vehicle and a game portal (the pad you need to place your characters on to activate in the game). We also got a poster showing all the figures and vehicles (20 of each) available for collection with the Superchargers game. The pack also included a pack of BattleCast cards, which is a brand-new game coming out in 2016. (Be sure to follow Tech Age Kids, as we'll cover BattleCast when it is released - it is looking very cool). My boys love collecting cards, so we are looking forward to the launch of BattleCast. Skylanders Superchargers is rated 7+ for fantasy violence and allowing players to interact with other players online. My 4 year old happily plays the game with his 7 year old brother, however our Wii version doesn't have the online game function. As far as game play difficulty is concerned, it is very similar to Nintendo Mario Carts, and so my younger son, quickly got the hang of manoeuvring his vehicle through the race. The actual figures and vehicles look and feel like normal toys and so if your kids are not playing the game, they could use the toys in imaginative play. The vehicles actually have moving parts, which is really cool. Parent warning: Skylanders can become a very expensive game. However we like that Skylanders have thought about this, so you can use all your characters from previous series in Superchargers (unfortunately this isn't the case for us as newbies). 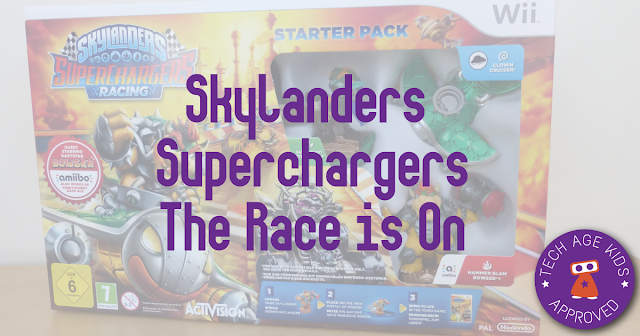 We found the Skylanders Superchargers starter pack well priced and you get a lot of exciting game play. You can buy a starter pack (~$74.99) for Superchargers for many consoles including Wii, Wii U PS3, PS4, XBox One, XBox 360, 3DS and iPad. There's a Dark Edition starter pack which is slightly more expensive (~$99.00) but has 3 figures and 2 vehicles, where the standard starter pack only has 2 figures and 1 vehicle. Additional figures and vehicles are priced at ~$14.99 each and Combo Packs which include a figure and its vehicle is more expensive. There are 20 characters and 20 vehicles to collect, each bringing unique abilities and powers. You can see how Skylanders can easily become an expensive game to invest in. Some parents may invest in the game and then get kids to purchase additional characters with pocket money. Alternatively you may consider offering characters as rewards for achievement in school or clubs or behaviour. 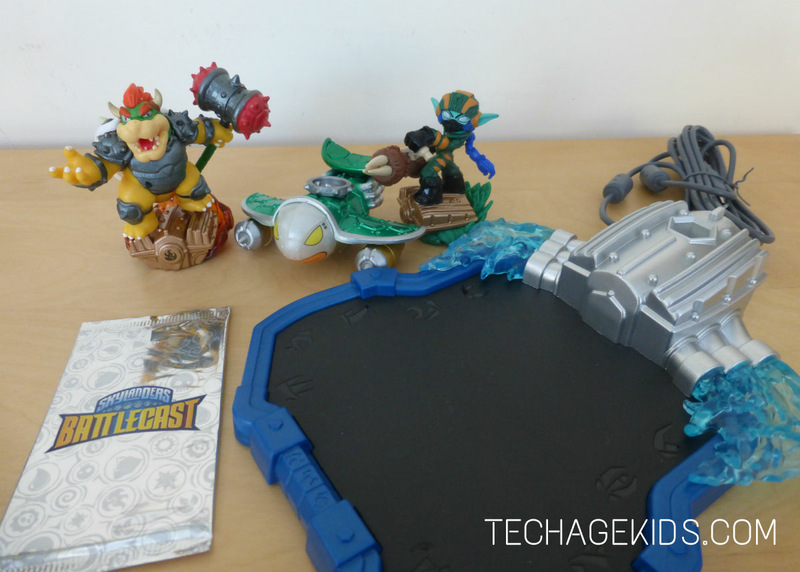 Tracy admitted to bribing kids with Skylanders characters - what do you think? We think the biggest challenge for families this year will be deciding which "Toy to Life" game to purchase. Not only has Skylanders brought out Superchargers with additional figures AND vehicles, but Disney Infinity 3.0 Star Wars and Lego Dimensions are also launching their toy to life games before Christmas. Kids are naturally drawn to brands they know, so Lego and Star Wars may cause parents to think carefully about which game to go for. Toys to life games are great fun, but they can also cause problems for families that can't afford purchasing more and more characters. Maybe in the future there will be a library of characters that kids can borrow or perhaps you can swap figures with friends. If you are already heavily invested in Skylanders, then the Superchargers would be a great game and perfectly compatible with the figures you already own. We'll be giving our opinion on Disney Infinity 3.0 and Lego Dimensions, so sign up to our newsletter below to get our latest posts in your inbox.